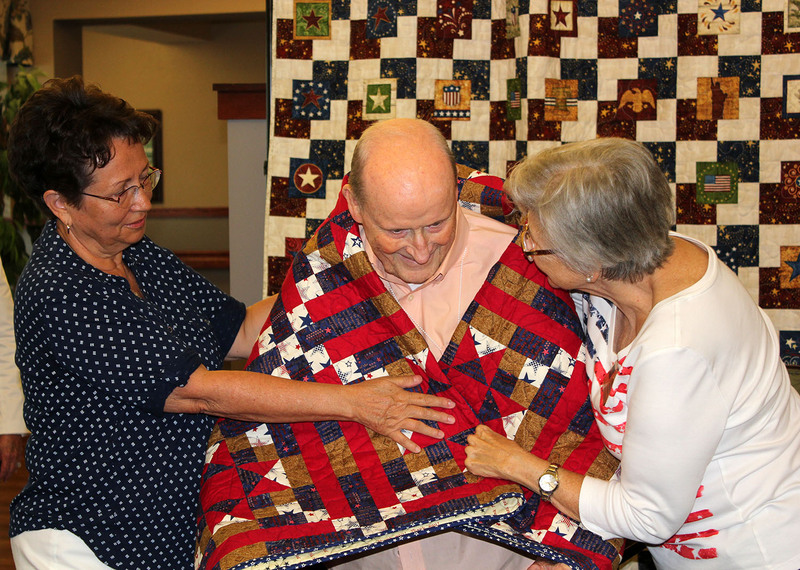 On August 4, representatives from the Quilts of Valor Foundation Omaha Chapter and Daughters of the American Revolution La Belle Vue Chapter honored Harold Hamilton, “Ham,” with a ceremony, one-of-a-kind Quilt of Valor and pin. A group of family and friends visited Cottage #40 for the Saturday morning presentation. Another elder, who has become friends with Ham in his Cottage, sat front row for the ceremony to support her friend. Throughout the presentation, many had tears in their eyes as they listened to the extensive service Ham provided to the US Air Force. Ham found himself fighting back tears at times, so honored to be recognized. 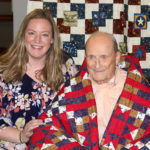 Great joy came to his face as he was wrapped in his Quilt of Valor. Ham entered the Air Force in 1943 at just 17 years of age. 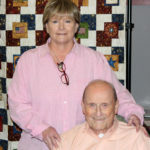 Over the 38 years Ham served in the Air Force, he and his family (wife Louise and four children) traveled all over – Mexico, Hawaii, Vietnam, Spain, England, Washington, DC, Bolivia. Among much else, he co-piloted KB-29 tankers, flew KC-135 air refueling tankers, refueled B-47s and even took the record for refueling the SR-71 speed run from New York to London. Ham served in several commander roles as well as worked in the US Embassy and the Defense Intelligence Agency. During his service, he received a World War II Victory Medal, the Vietnam Service Medal with three bronze clusters and a Bronze Star. In 1980, Ham returned to the states to serve at Offutt Air Force Base in Bellevue and later retired the Air Force in 1981, remaining in the Bellevue area. He then served as the Chairman of the Business Adminstration at Bellevue College (now Bellevue University) for 15 years and as the Director for Offutt Air Force Base for Embry Riddle University for more than three years before retiring entirely and spending time with his loved ones. “I appreciate everything you’ve done, and I appreciate this day,” Ham said at the end of the Quilt of Valor presentation. Ham’s family and friends then enjoyed photos together as well as lunch. 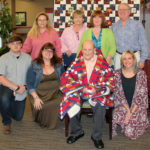 Thank you to the Quilts of Valor Foundation and Daughters of the American Revolution for making this Saturday morning so special for Ham and his loved ones! Family friend Alex Lawton smiles with Ham. Lawton nominated Ham for the quilt. Ham smiles with his daughter Trish Lortz. Ham and his family take a photo after the presentation. 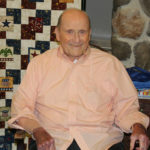 Ham smiles before his Quilt of Valor presentation.